To start a litigated divorce, you or your lawyer must prepare a document that sets out your claim and provides supporting information to show that your claim is valid. This document is known as an “application for divorce”. There will also be additional documents, such as a financial statement if there are contested financial issues. These documents are then taken to the court. The court assigns a file number to your case, and stamps your application. This is known as “issuing” your application or petition for divorce. Your application for divorce must then be sent to your spouse. This is known as “serving” your spouse. Your spouse must be served in person, which means that the application must be delivered to your spouse or their lawyer. Once your spouse has received your documents, he or she has 30 days to respond in what is known as an Answer. If your spouse does not respond to your application for divorce, you have the right to proceed without any further notice to your spouse. However, normally a response is filed, and you have the right to reply to anything your spouse says within 10 days, through a Reply. The first event in a court case is called a “first appearance” at which time a court clerk or registrar (not a judge) will review what has been filed with the court to ensure that everything is in order. If you and your spouse have served and filed your material and nothing is out of order, a case conference date is scheduled. A case conference is relatively informal, but it is held before a judge or master. 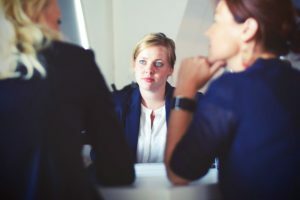 Prior to the case conference, you must prepare a brief summarizing the issues in dispute, and what sort of resolution you are seeking. At the case conference, the judge will not resolve any of the main issues in your cases. Rather, the judge will deal with procedural matters – such as matters such as financial disclosure, questioning, or the appointment of a child assessor. If it makes sense, the judge will also try to use the opportunity to mediate the issues in your case, or to narrow them down. Often, the judge will give an opinion as to how he or she would decide the case. This can be a very powerful tool to settling your case early without further court proceedings. A motion is a request for a temporary court order prior to the end of your case. As a legal case may last for a year or more, you may not be able to wait until your case is done for a court order. For instance, you may have a clear entitlement to child support, but your spouse is not paying it. You can’t afford to wait for a year or more until you receive the child support. In that case, you can bring a motion and ask the court for temporary child support until your case is finished. Similarly, you can ask for spousal support, custody and access, possession of the matrimonial home, and any other issue that cannot wait. At the motion, which is a formal court appearance, the judge will listen to your legal arguments, your spouse’s legal arguments, and then make a decision on the issue. Except in the case of an emergency, a family law motion cannot be brought before a case conference. An emergency means just that – for instance, violence or abduction of children. A motion can’t be brought before a case conference just because you’re in a hurry to get things done. In many courts, you will specifically need an order for a judge declaring your matter urgent before you can schedule a motion. The documents necessary for a family law motion are a notice of motion and an affidavit. The notice of motion is a document that lets the court know what order you are seeking. The affidavit is your sworn evidence under oath that tells your story and why you are entitled to the order you are seeking. You can also get affidavits from witnesses who can speak to a relevant issue. Before your case can be completed, there is a lengthy and often expensive process known as discovery. In this process, you and your spouse exchange information, primarily financial documentation. This serves two purposes. First, you are building your case. Second, you are learning your spouse’s case, so that you can find out the weaknesses in your spouse’s case. Towards the end of the discovery process, there normally are out of court examinations, called either questioning or an examination for discovery. These are examinations of each party by the other, held under oath. The purpose is to narrow the issues between the parties, to test the strength of the other party’s case, to obtain full evidentiary disclosure and tactically, to test the other party’s presentation as a witness. After the case conference, motions and discovery are completed, a settlement conference is held. As the name suggests, this conference is designed to encourage the settlement of the case. At the settlement conference, the judge listens to both parties’ arguments. A brief must be prepared and filed with the court beforehand. Based on the brief, and the arguments made at the conference, the judge will make recommendations as to how he or she would decide the case if he or she were hearing it at a trial. This conference is usually a last attempt to avoid the time and expense of a trial. If progress is made at the settlement conference, then often a second or even third settlement conference will be scheduled in a further attempt to settle the case. This step is mandatory if you do not have a lawyer, and optional otherwise, but still a good idea to schedule. If a trial in your case is inevitable, this case will deal with the minutiae of your case, such as evidentiary issues, witnesses, admissibility of documents, experts, scheduling, and more. The idea is to deal with all issues that need to be dealt with to ensure the trial goes smoothly. A trial is a very formal procedure. In the interest of fairness, rules of evidence and procedure are strictly enforced. Witnesses testify before the judge, documentary evidence is presented in a particularly formal way and finally each side makes an opening and a closing statement that contains submissions on what the relevant law is. At the conclusion of the trial the judge finally decides all the issues in your case. A typical trial can last one week or more.